Looking for a great day trip from Memphis? Check out our real-life itinerary for our day trip from Memphis, Tennessee to Tupelo, Mississippi and back again (including our ridiculously Hobbit-like meal schedule). While on a recent trip to the Memphis area, Mr B and I found ourselves with an extra day on our hands, so we decided to broaden our horizons by taking a day trip to Tupelo, Mississippi, best known as the “Birthplace of Elvis.” And yes indeedee, we saw a heckuva lot of Elvis on this trip, but there’s more to Tupelo than just the history of its favorite son. 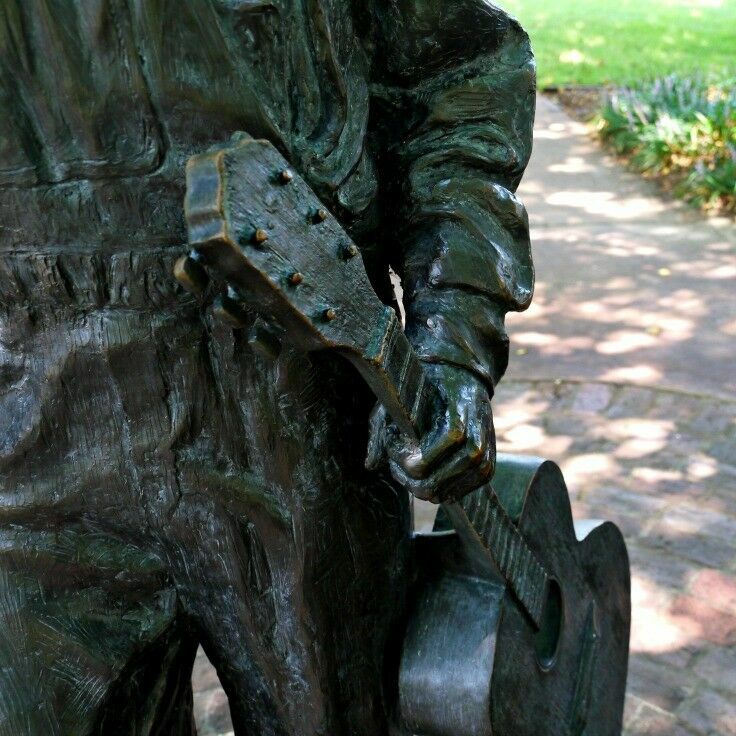 Tupelo, as it turns out, has a lot to offer. For example, did you know that the 444-mile historic Natchez Trace Parkway is headquartered in Tupelo? Or that one local man amassed a private collection of automobiles so extensive that Tupelo now boasts the official automobile museum of Mississippi? 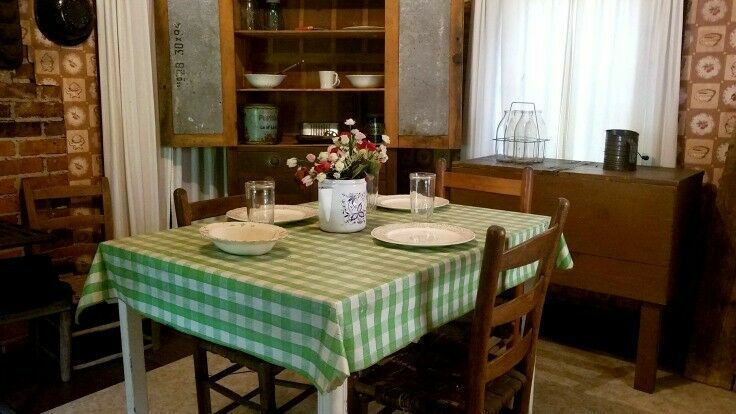 Or that, in Tupelo, you can legitimately have fried chicken, biscuits, and gravy for breakfast!?! 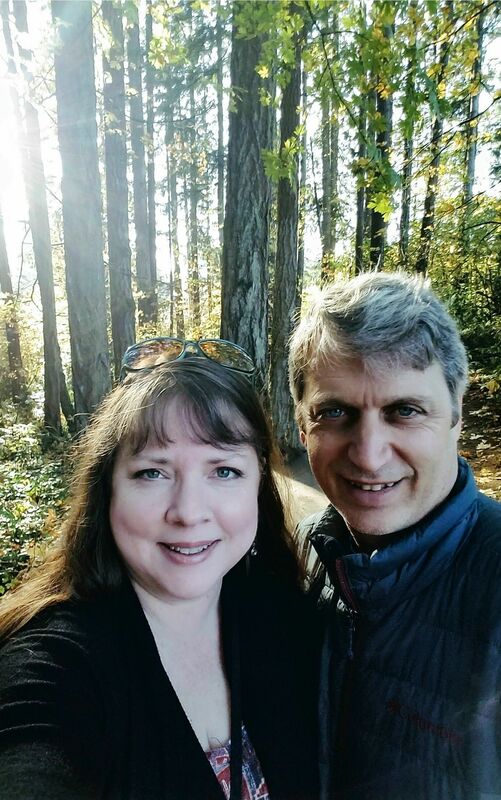 What follows is the real-life itinerary from our day trip; traveling from Memphis, Tennessee to Tupelo, Mississippi and back again via the Natchez Trace Parkway. I’ve also included our ridiculously Hobbit-like meal schedule in the itinerary (breakfast, second breakfast, lunch, etc. ); however, if you are using this as a roadmap for your own day trip, don’t let our eating times or choices hold you back. 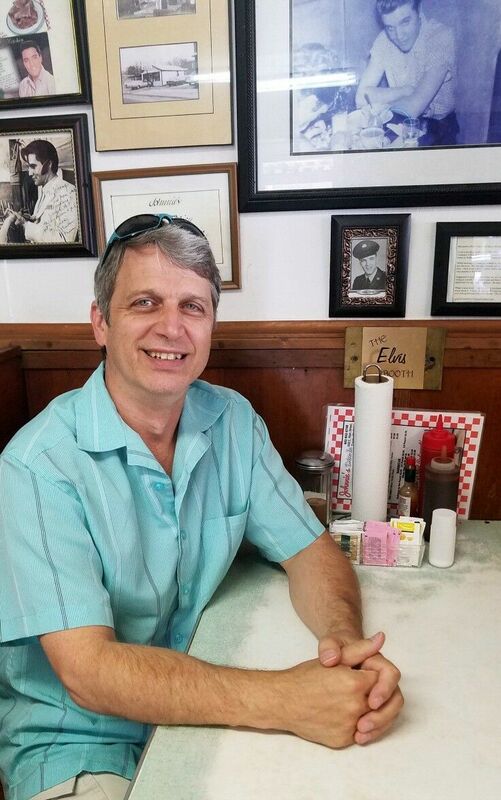 There are plenty of wonderful places to eat in Tupelo that we didn’t get to. In fact, if you find a great spot to eat in Tupelo, we’d love it if you’d take a minute to share your discoveries in the comments below! 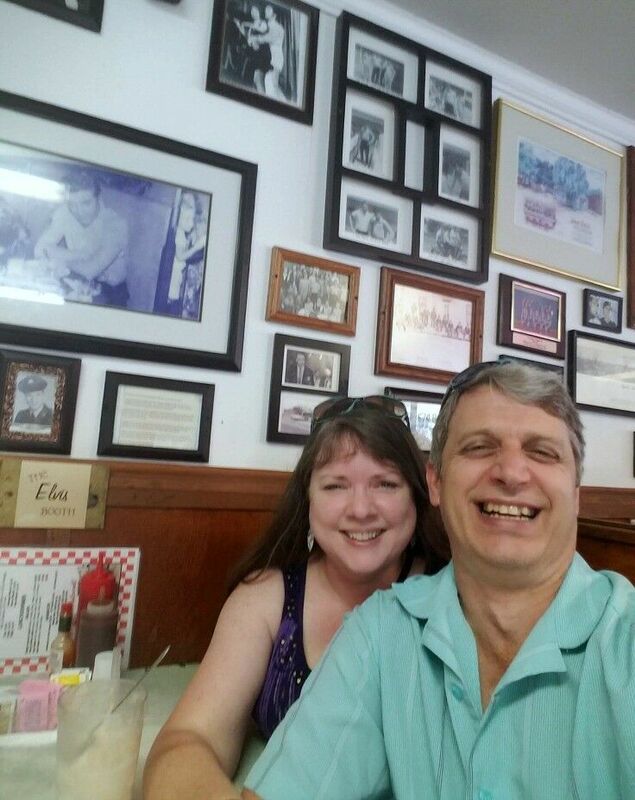  We wanted to arrive in Tupelo by 9am, so we had a light breakfast and then hit the road in Memphis about 7:15 am. It took about and hour and forty minutes to drive the 108 miles from Memphis to Tupelo [via I-22].  First stop: Connie’s Chicken. Ready to get your carbs on? If you crave pillow-soft, buttery biscuits, crispy fried chicken, and lots of smooth, savory white gravy like your grandma used to make, Connie’s is your kind of place. This uber-casual comfort food hub serves it all up counter-style with bright smiles, friendly service, and reasonable prices. I had the tenderloin biscuit with gravy, and Mr B had chicken, and we shared a couple of warm blueberry donuts, fresh from the fryer.  From Connie’s, go directly to the Tupelo Visitors Center. Tupelo has an excellent Visitors Center! 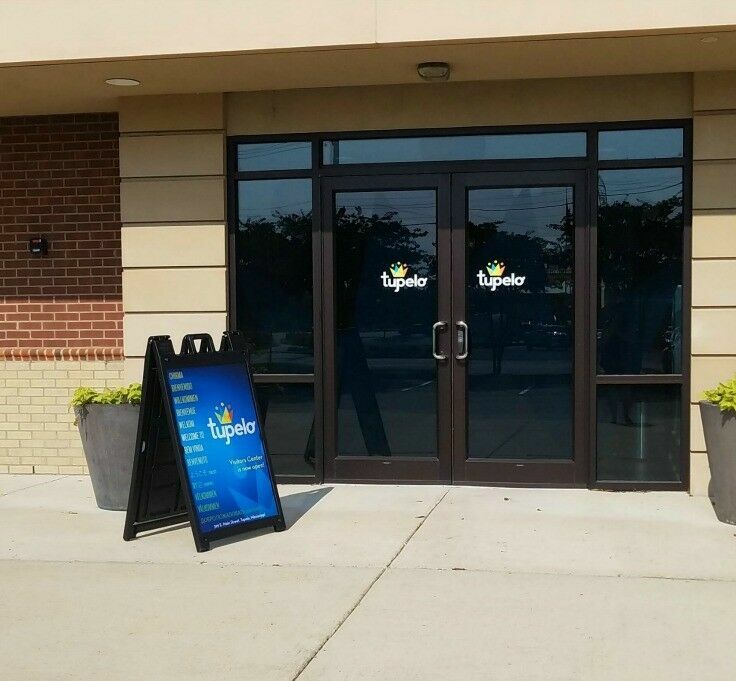 Newly opened in 2018, the Tupelo Visitors Center is the perfect starting point for your day. 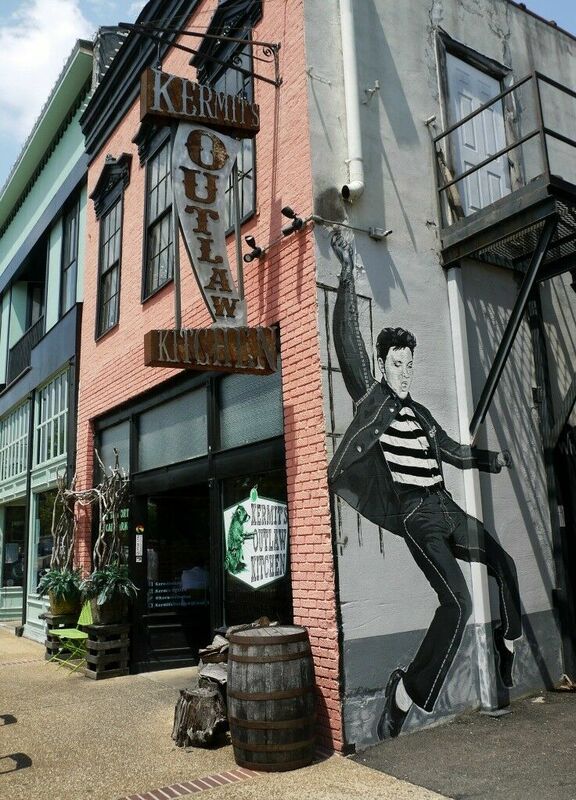 Stop in and get the low down on the best attractions, arts, culture, outdoor recreation, shopping, and Elvis locations in the area. At the visitors’ center, you can play with the interactive kids’ map, plan your itinerary, or pick up relevant informational brochures; including Elvis Driving Tour and Elvis Guitar Tour maps. There is also a display that allows you to hear the African American gospel, country, and blues music and musicians that influenced Elvis as a boy, and understand better how he integrated them into his unique musical style. Even if you don’t plan to follow this tour, the brochure provides a good overview of the town and will likely help you plan your day. Elvis Aaron Presley was born in Tupelo, Mississippi, on January 8, 1935, in a 450 square foot, two-room house built by his father, grandfather and uncle. 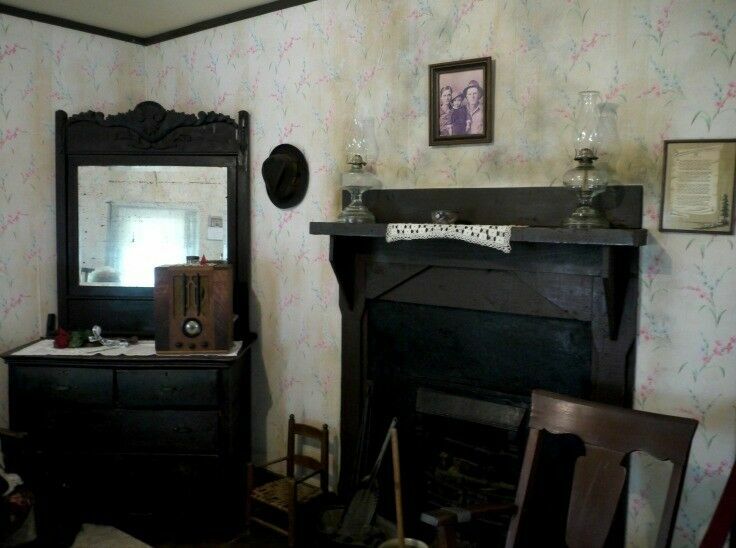 The house is now one of the main attractions of the Elvis’ Birthplace and Museum. 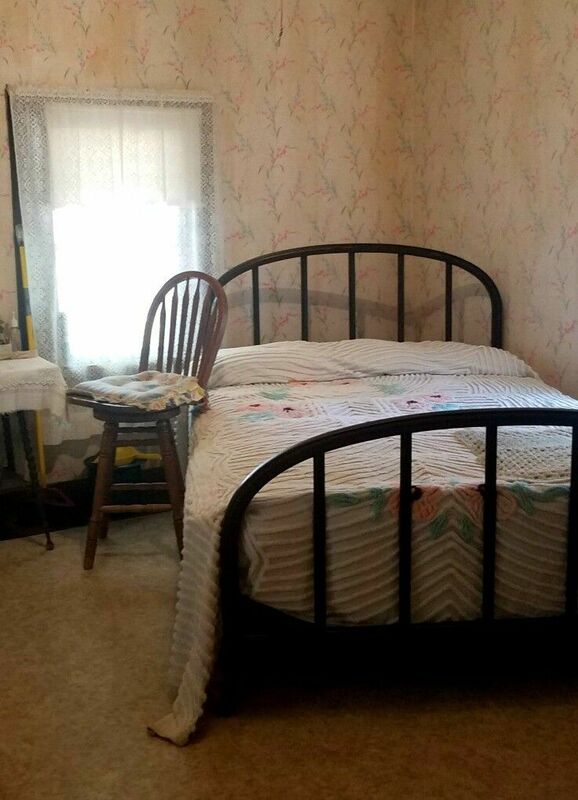 The moment we opened the door to Elvis’ childhood home, an unexpected wave of familiarity swept over me – it smells exactly like my Grandma Lucy’s house! 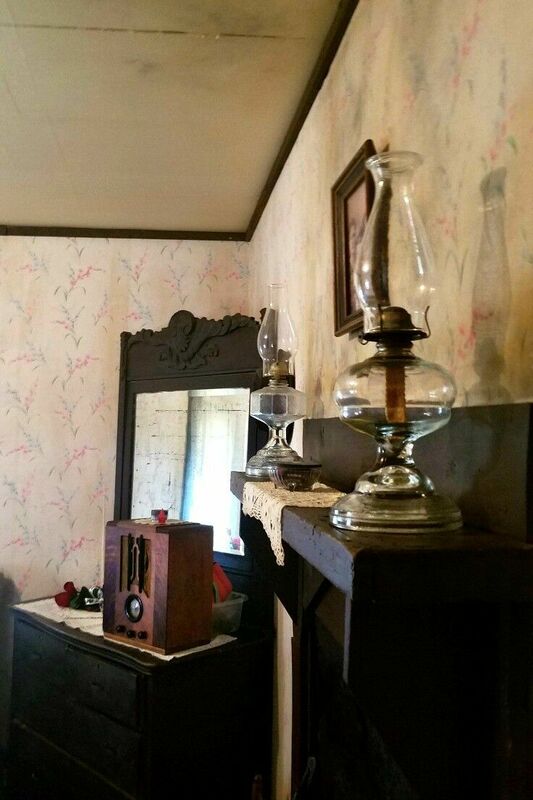 As we stepped inside, a delightful docent greeted us, and enthusiastically shared both her knowledge of Elvis’ early life and details about the home, as well as her philosophy on a community’s responsibility in raising its children. She was abundantly entertaining. 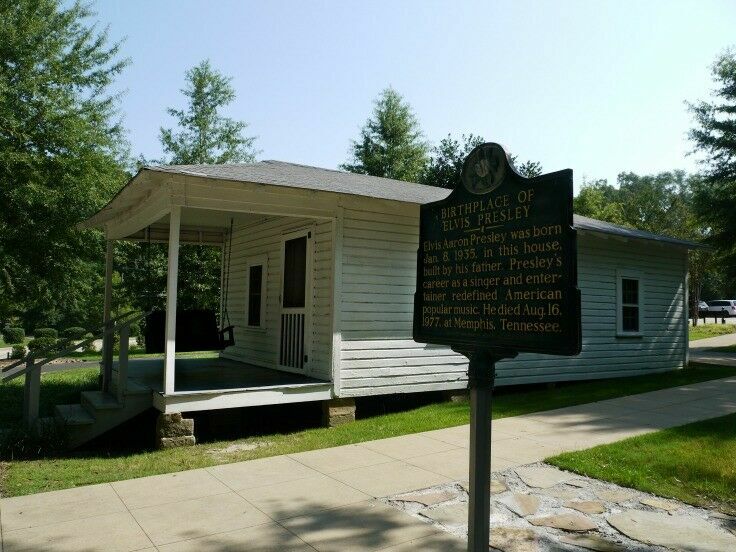 The actual building where the Presley family attended church services has been moved to the Elvis Birthplace location. It was inside the walls of this small community chapel that Elvis was first introduced to the Southern gospel music that wove its way into his music throughout his life. 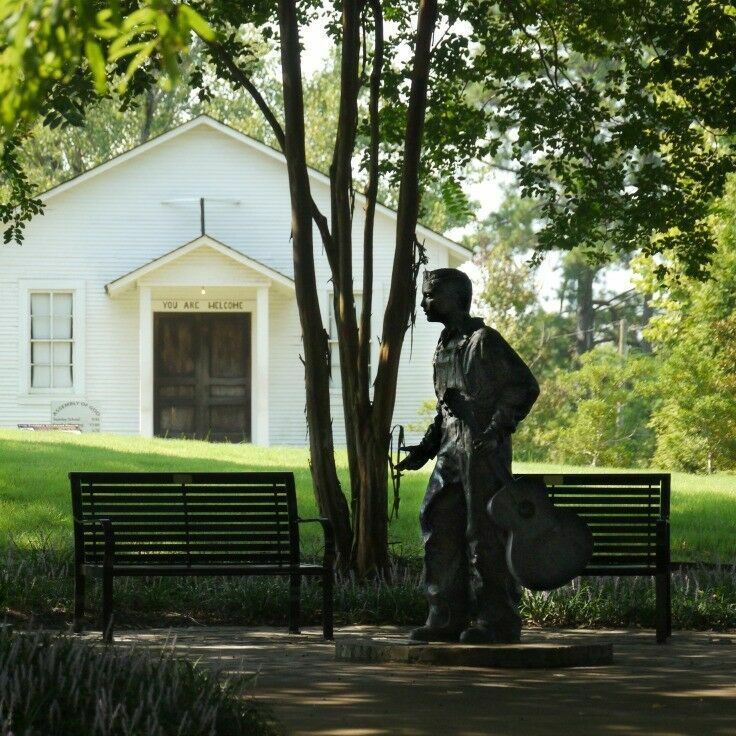 Through a multimedia presentation, visitors to the chapel experience a condensed church service, and are introduced to Elvis’ early musical influences; including Brother Frank, who taught Elvis his first guitar chords, and the gospel quartets that inspired his music. 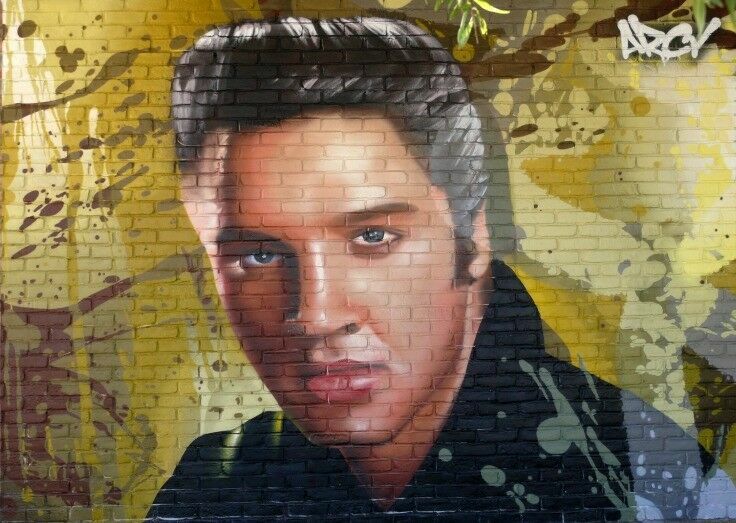 If you want to tour the house or the chapel, you’ll need to purchase tickets, but you can walk the grounds and see the exterior of Elvis’ birthplace (still in its original location) free of charge. Tickets to tour the house, chapel, and museum are available for purchase inside the lobby. The earlier you arrive here, the better: this is the Big tourist attraction in town and it gets busy quickly.  After completing your tour of Elvis’ Birthplace, head over to Johnnie’s Drive-In. Mr B and I stopped in at Johnnie’s mostly because we are both hopeless romantics and it sounded like a good idea. We were thrilled when we walked in just as the “Elvis Booth” was being vacated, and took our seats before any other crazy Elvis tourists could steal the honor. Mr B and I decided to skip the food and share a root beer float, which turned out to be a great deal because the friendly waitresses at Johnnie’s kept refilling our glass with root beer every time it got low until we finally finished off the ice cream. I’d share a root beer float with this guy anytime! My name is Paul Cramer, and this is the story of my Elvis picture. I was a traveling salesman in 1956, selling costume jewelry, for the Gerson Company out of Kansas City, MO. My territory was the South. I visited jewelry stores in Alabama, Mississippi, Georgia and Tennessee. While I was showing my wares to a jeweler in Tupelo, Mississippi, a teenage girl came into the store. She was out of breath and very excited screaming “Elvis is next-door – Elvis is next door!” I didn’t know who Elvis was, but she told me he was very popular in the South. I happen to have my camera in my car, so I went next door to the café. Elvis was sitting in a booth with another man and there were a few girls around. I asked him if I could take his picture. He said, “OK,” so I took it! When I came home, I had the picture developed and put away, not thinking much about it. I forgot about it until I came across it in 1997, 41 years later, as I was looking through old photo albums. This is how I took Elvis’s picture. We are abysmally bad at taking selfies, but at least we have fun while we try!  Next stop: Downtown Tupelo. 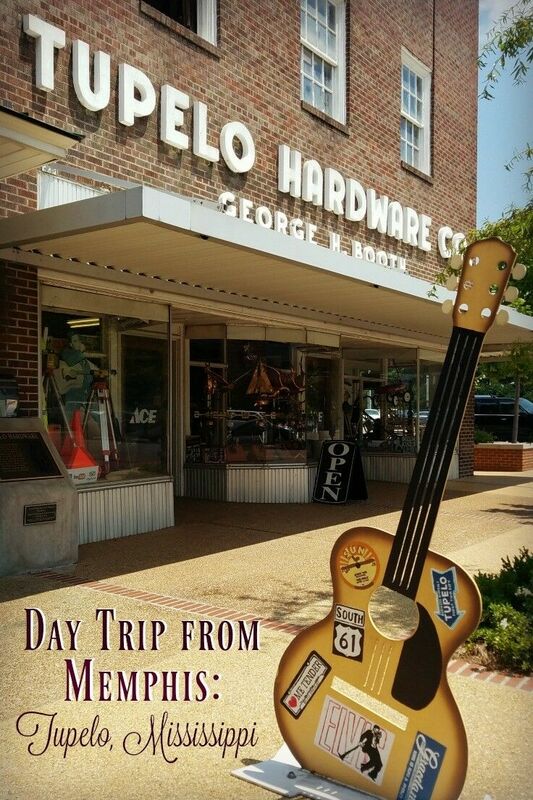 Visit the Tupelo Hardware Store, where Gladys Presley purchased Elvis his first guitar for $7. 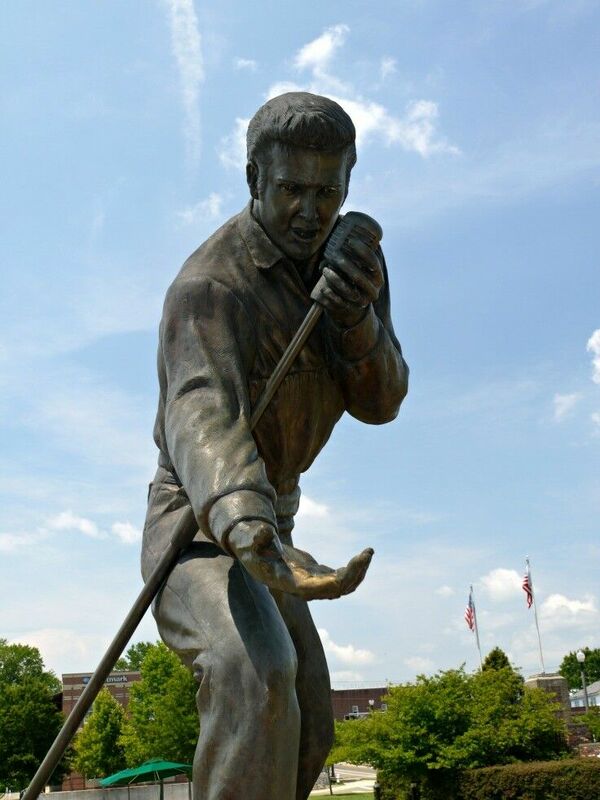 Tupelo Hardware is one of twelve sites in Tupelo that are marked with bronze plaques on the Elvis Presley Driving Tour, signifying it as having played an important role in Elvis’ formative years. It was at this store that Gladys Presley, Elvis’ mother, purchased his first for his 11th birthday in 1946, for $6.95. Tupelo Hardware is a fully functioning hardware store (with excellent cast iron offerings! ), and visitors are welcome during the store’s regular hours. 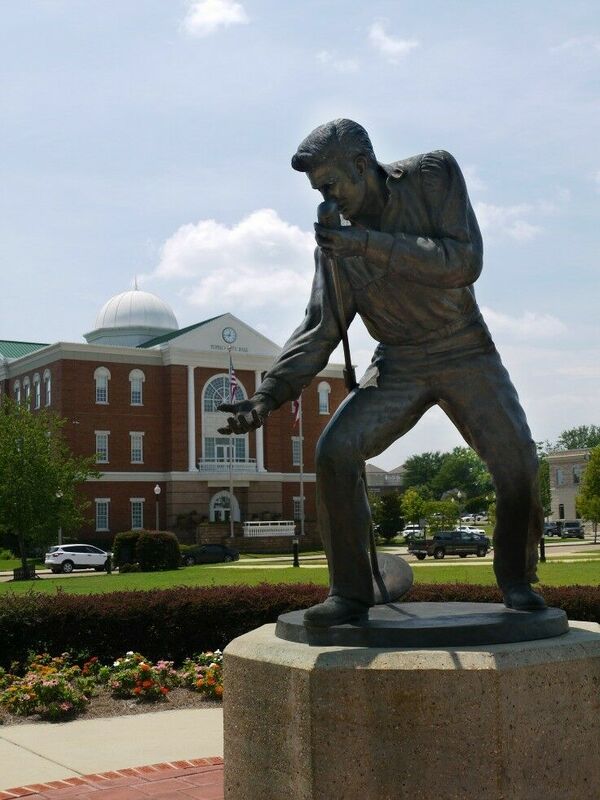  Drive (or walk) to the Tupelo FairPark, where you can enjoy the wide open-space, the Elvis Homecoming statue, city hall, a small children’s park, and a small but refreshing splash pad. In 1956, Elvis returned to Tupelo and performed a Homecoming Concert at the Mississippi/Alabama Fair and Dairy Show Fairgrounds. 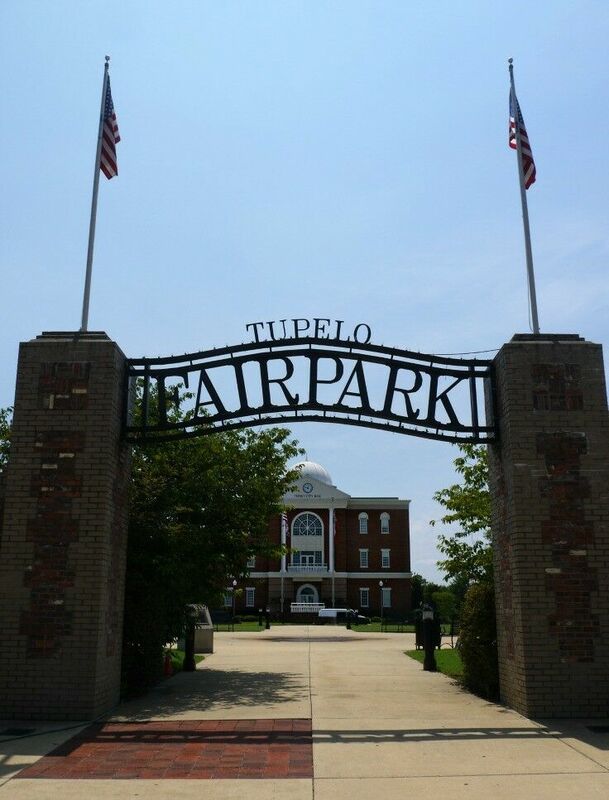 Now known as FairPark, it is home to Tupelo’s annual Elvis Festival, held the first week in June each year. The festival features live music, with past past performers including such artists as Little Big Town, Montgomery Gentry, and B.B. King. 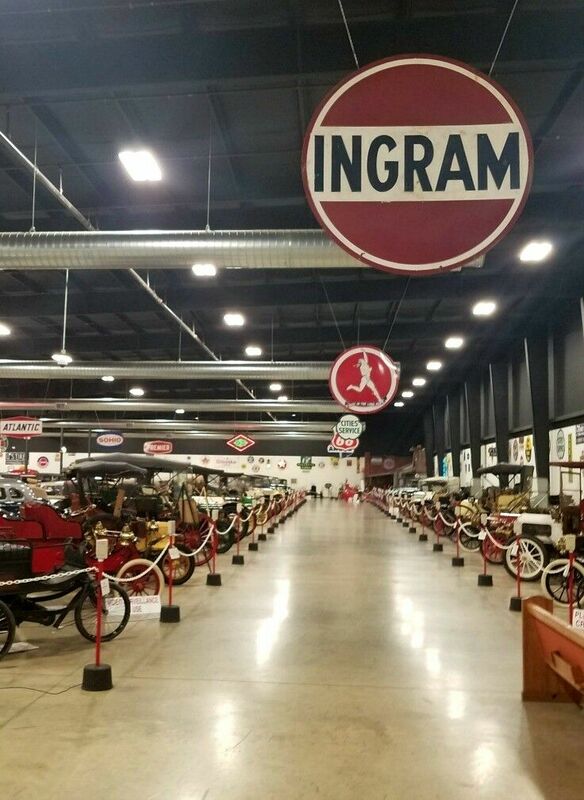  Head over to the Tupelo Automobile Museum and spend an hour or so motoring through the past. I have to admit that the Tupelo Automobile Museum came as a bit of a surprise. You just don’t expect a town the size of Tupelo to be home to one of the most extensive car collections in the United States. It was pretty amazing, and well worth the entrance fee. 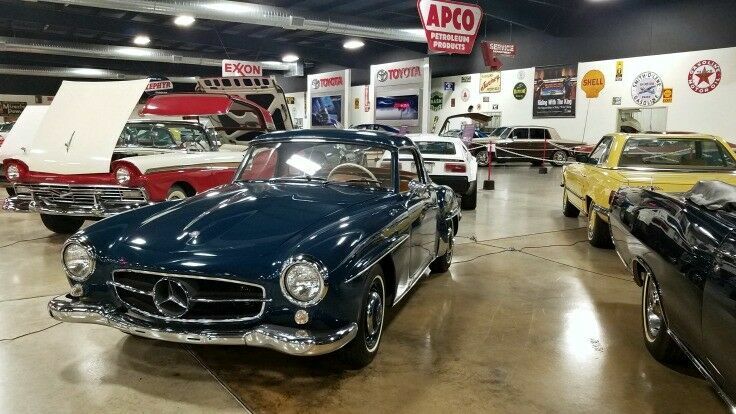 The Tupelo Automobile Museum houses over 100 antique, classic, and collectible cars, all chronologically displayed to illustrate the progress of auto design and engineering over the 100 years. The oldest car in the collection is a 1886 Benz; the newest is a 1994 Dodge Viper. 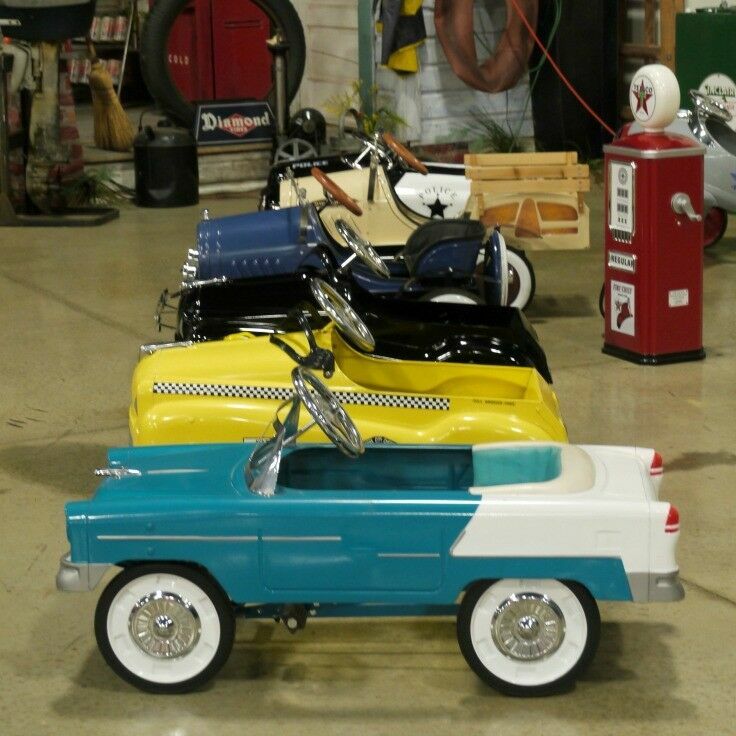 This collection of kid cars brought back some fond memories.  Grab a late lunch at the Neon Pig. Before heading back to Memphis via the Natchez Trace Parkway, we stopped to grab a world-class burger at the Neon Pig. The Neon Pig Café is the only all-in-one butcher shop and restaurant in Mississippi, and lays claim to one of the best burgers in America. 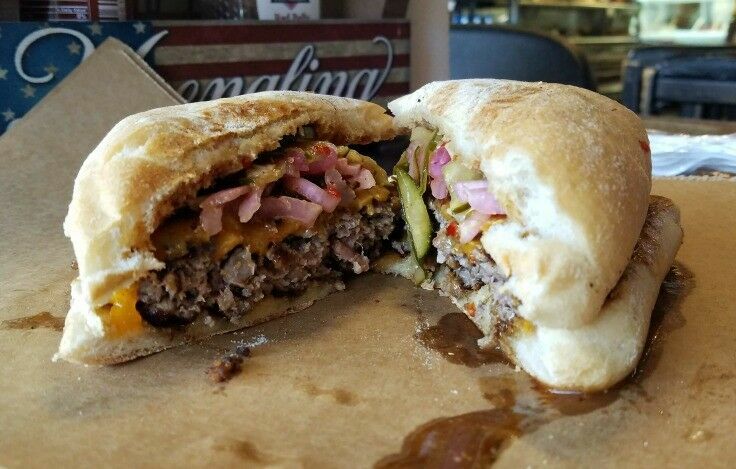 The Neon Pig’s Smash Burger was officially named “Best Burger in America” by thrillist.com in 2015. The Smash Burger is a combination of aged filet, ribeye, sirloin, New York steak, and Benton’s bacon, all ground together to give it a strong, smoky flavor. It is served on a ciabatta bun with bacon bits, cheddar cheese, onion, and a housemade comeback sauce. Mr B and I decided to split one burger, which was more than enough, and ordered coleslaw and potato salad on the side. I don’t eat enough burgers to know if this is The Best burger in the US, but it was definitely delicious. (In my mind, the distinction of “world’s best burger” will always and forever go to the T-burger from the Twilight Room [i.e., T-Room] on Lombard in Portland, Oregon.) The ciabatto bun held up well to the imposing mass of meats and sauce, and the flavors all played very nicely together. 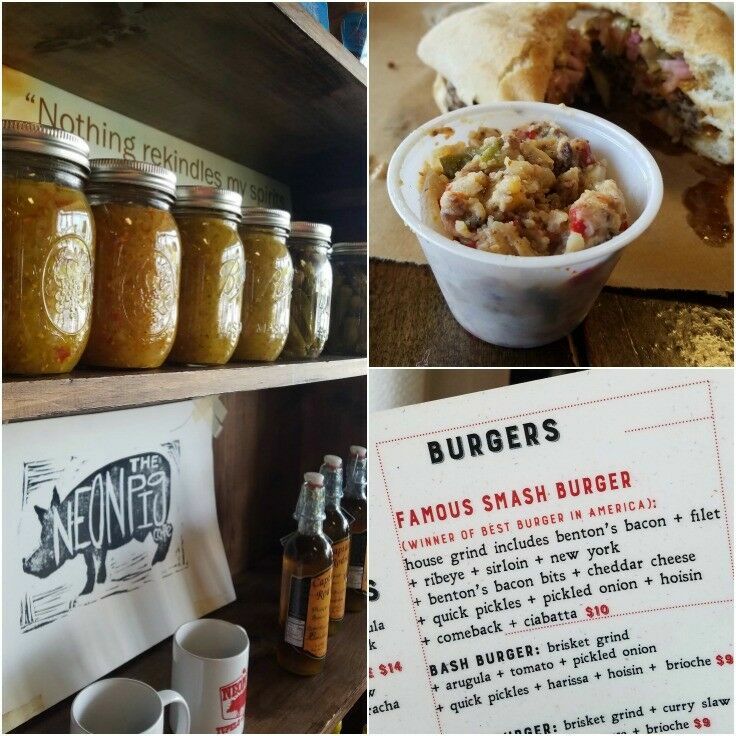 My best advice for eating at the Neon Pig is – DO NOT SKIP the potato salad! It is amazing! I’m certain that it has more bacon products in it than any ten average potato salads, and that’s probably why it’s so crazy-good. 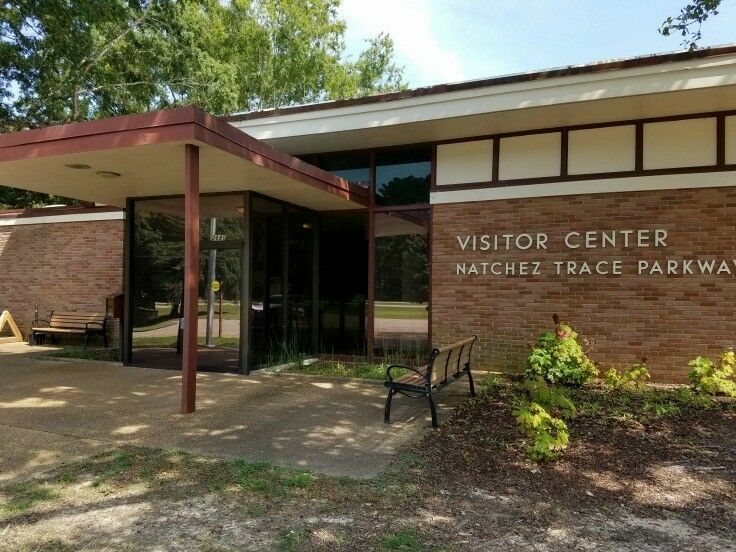  Stop by the Natchez Trace Parkway Visitors Center just outside of Tupelo. The Natchez Trace is a primitive trail once traveled by Native Americans over 8,000 years ago, spanning 444 miles and reaching from Natchez, Mississippi, to Nashville, Tennessee. The Natchez Trace Parkway, headquartered in Tupelo, is one of America’s Top 10 National Parks. 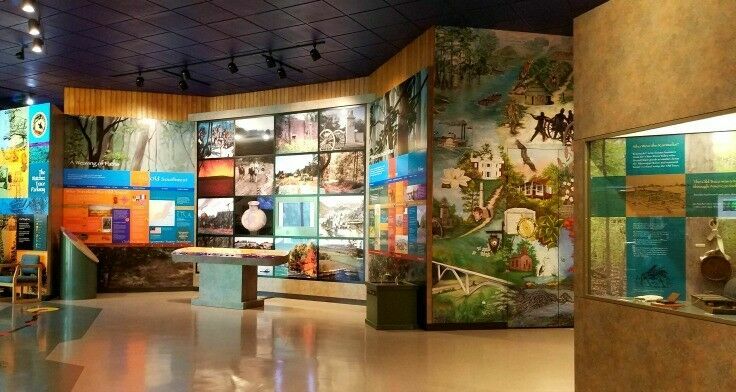 Guests can explore the Natchez Trace Parkway Visitor Center and discover the parkway’s rich history and inhabitants. If you stop in, be sure to pick up the “Natchez Trace Parkway” map/brochure issued by the US Park Service. We found it to be invaluable as we took our tour of the Trace.  Drive the Natchez Trace north from Tupelo to where it intersects with Highway 72; roughly 11 miles into Alabama from the Tennessee-Alabama state line. 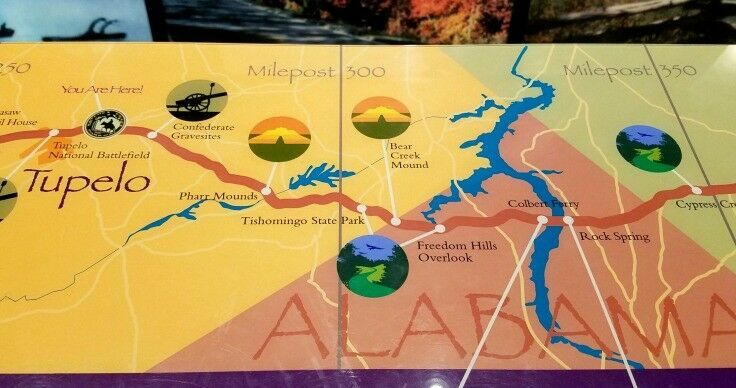 It took us about three hours to drive the 50-some miles the Natchez Trace Parkway from Tupelo to where it intersects with Highway 72, which included plenty of time to take in most of the roadside interpretive sites along the way. There is so much history along this route, spanning cultures across millenia, and it simply wouldn’t do it justice to bury it here at the end of an already lengthy post, so we ‘ll be covering it next week instead. 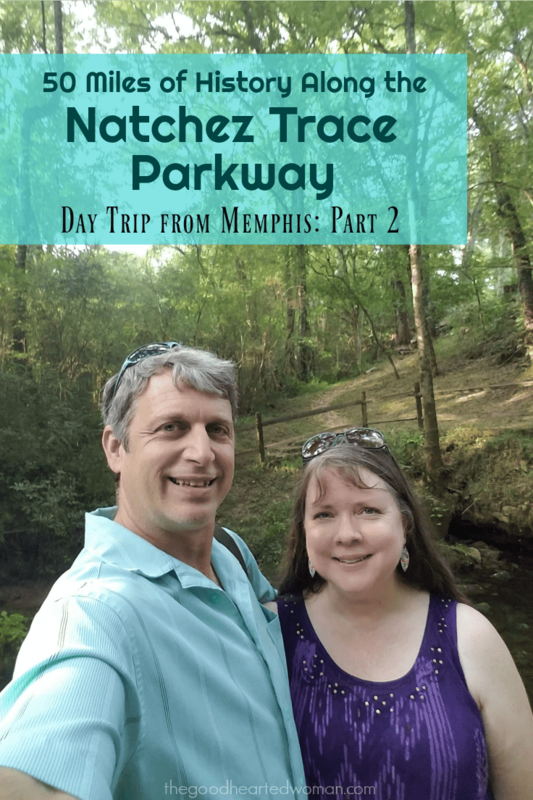 Tune in next week to read all about our adventures in Day Trip from Memphis: Part 2 – Natchez Trace Parkway. To arrive in Tupelo by 9am, plan to hit the road in Memphis about 7:15 am. Eat a little something for breakfast before you leave to tide you over. 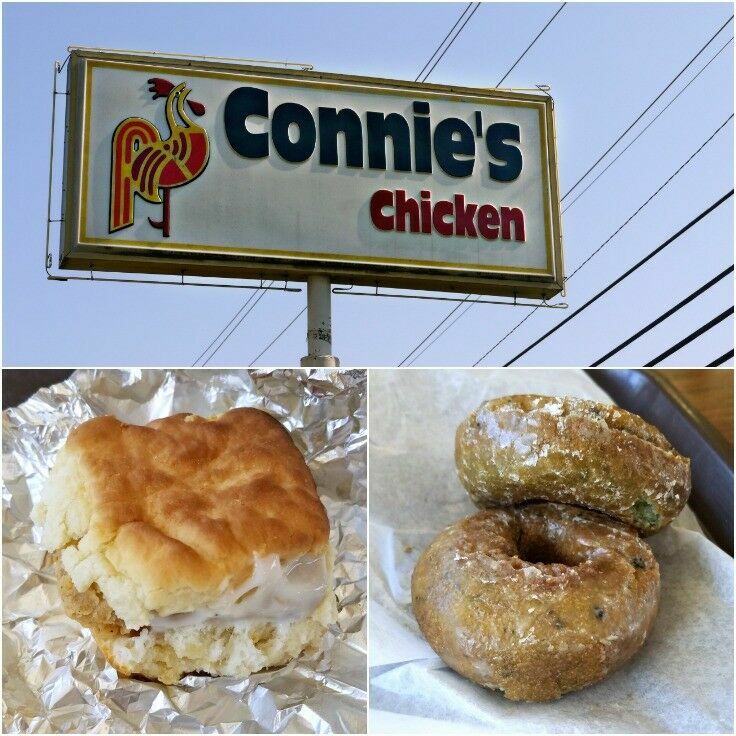 Stop in at Connie’s Chicken for a carb-intensive second breakfast of fried chicken, warm biscuits, gravy, and fresh blueberry donuts. From Connie’s, go directly to the Tupelo Visitors Center. 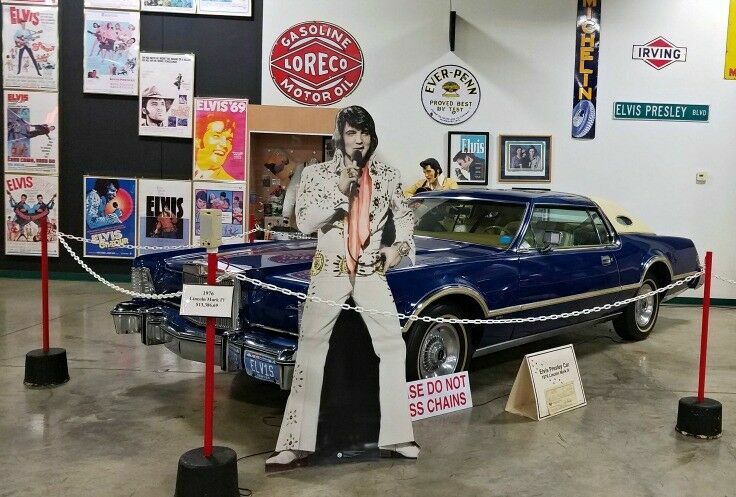 Take a quick look around, play with the interactive kids’ map, and pick up relevant informational brochures; including Elvis Driving Tour and Elvis Guitar Tour maps. 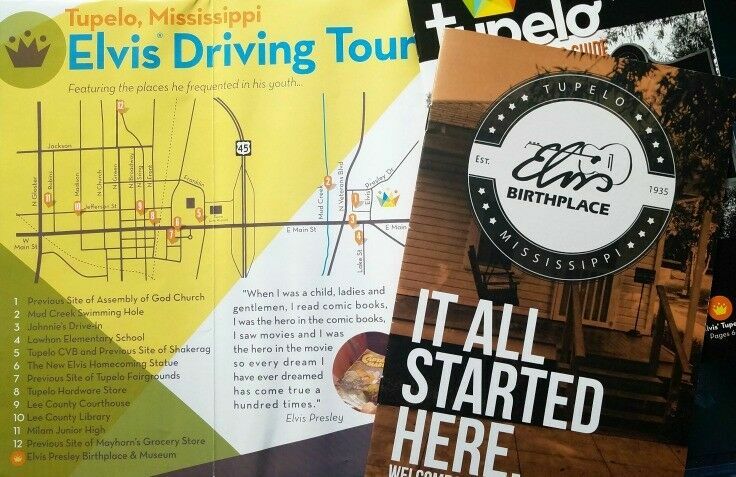 Drive to the “Birthplace of Elvis.” You can purchase tickets inside the lobby. The earlier you arrive here, the better: this is the Big tourist attraction in town and it gets busy quickly. 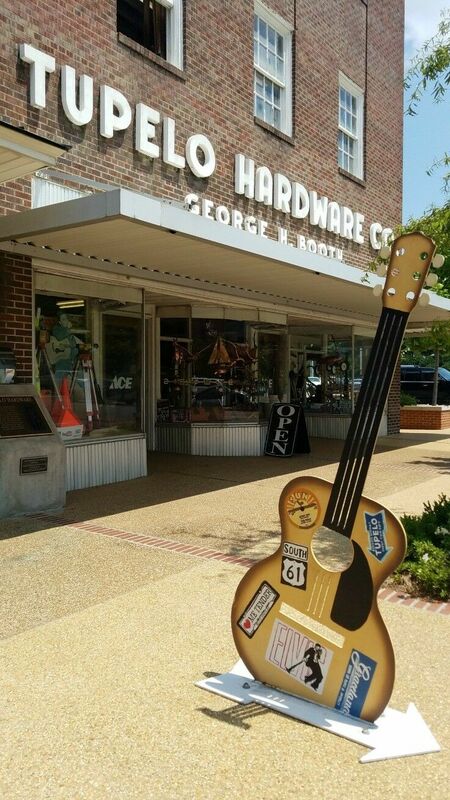 Visit the Tupelo Hardware Store, where Elvis purchased his first guitar for $7. 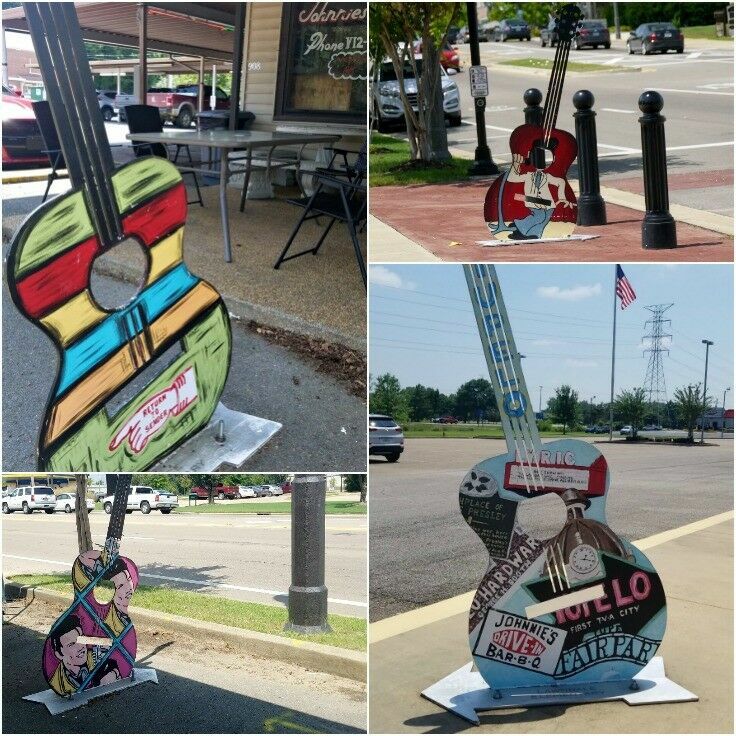 Stroll Downtown Tupelo and check out the cool local shops and murals. 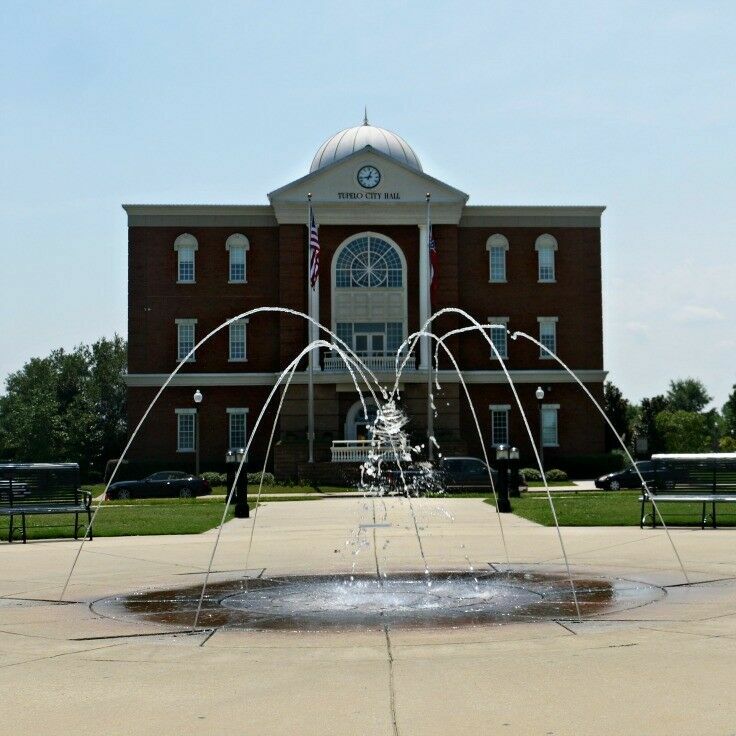 Drive (or walk) to the Tupelo FairPark, where you can enjoy the wide open-space, the Elvis Homecoming statue, city hall, a small children’s park, and a small but refreshing splash pad. 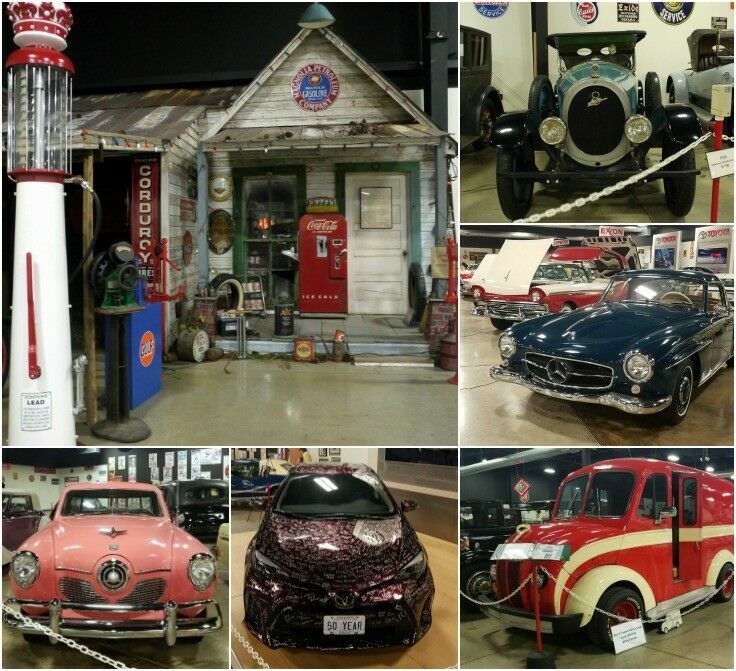 Head over to the Tupelo Automobile Museum and spend an hour or so motoring through the past. Stop by the Natchez Trace Parkway Visitors Center just outside of Tupelo. Be sure to pick up the “Natchez Trace Parkway” map/brochure issued by the US Park Service. Drive the Natchez Trace north from Tupelo to where it intersects with Highway 72; roughly 11 miles into Alabama from the Tennessee-Alabama state line. Total Round-trip Mileage (not including driving all over Tupelo) = 300 miles.